Irony in general, let alone in cooking, can be most entertaining. Much like watching a 1960’s Clint Eastwood movie, with the unmistakable music background contradicting the story that unfolds between cunning and pathos with an ending both surprising and desired. The disparity of intention and end result of our recent cooking adventures has quite simply been the consequence of in-process inspiration. 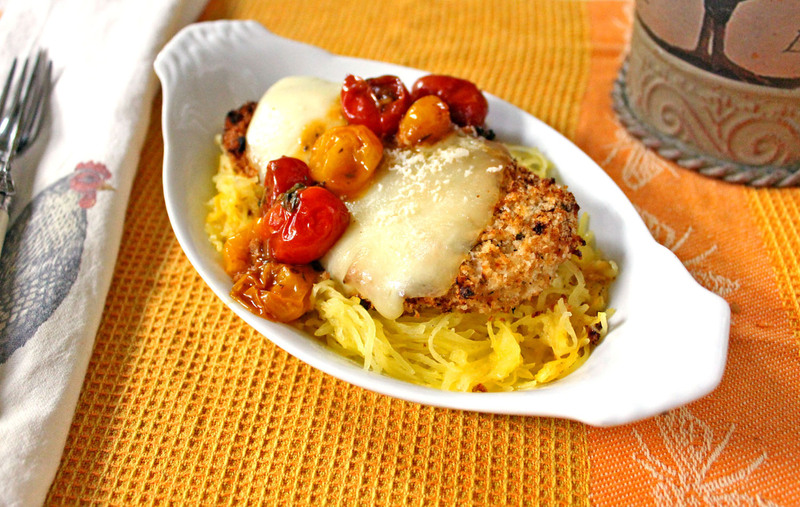 As it is harvest season, we were inspired to serve up a delicate spaghetti squash, in lieu of traditional pasta noodles, as the secret ingredient and base for this baked chicken parmesan. But as I scoured the refrigerator searching ingredients for an ad hoc sauce, the path and end result led to a delightful surprise. Slowly pan roasting tomatoes releases their essence and complexity, yielding a delicious and simple sauce. The combination of all the flavors, including the creamy chicken with stringy hot mozzarella, delivered comfort and satisfaction on this cool Fall evening. In a small bowl, combine mayonnaise, milk, and half of parmesan. Spread mayonnaise mixture evenly over both sides of chicken cutlets. Combine panko, garlic powder, onion powder, oregano, and remaining half of parmesan cheese in another dish. Dredge cutlets in panko mixture. Place cutlets on wire rack coated and place rack on a baking sheet. Bake for 15 minutes or until chicken is cooked through. Then turn on broiler, and top each cutlet with slice of mozzarella. Broil for 3 minutes or until cheese is slightly melted. Serve on bed of spaghetti squash and top with pan-roasted tomato sauce. Garnish with fresh basil. Slice squash in half and place flesh side down and scoop out seeds. Then place squash in baking dish, and add 1/4-inch of water to dish. Season squash with olive oil, salt, pepper, and coriander. Bake for 45 minutes until tender and then remove from oven and let rest. Rake squash with fork, creating spaghetti-like strands. In a medium skillet, heat 1 tablespoon oil over medium heat. Add shallot, garlic and tomatoes and cook for 15 minutes. Increase heat to medium high, and then add butter, wine, stock, thyme, and season with salt and pepper. Cook for 5 minutes then remove from heat. This entry was posted in Cooking, Fall, Main Dishes and tagged Cheese, Poultry, Vegetables by cfaust. Bookmark the permalink. This looks so good and might I say healthy. I have tomatoes roasting in the oven as we speak with sweet potatoes, and peppers. Love these simple dishes.